Mark your diaries for our next social mixer on 7th May at Club 18 with Sandra Smedhall, Founder & Managing Director of Style by Asia. Style by Asia is a web community based in Hong Kong, gathering individual bloggers who all are connected to the "style space" in one way or another; be it fashion, design (interior and industrial), architecture, photography, graphic design and all kinds of art - basically anything visual which serves as an inspiration to people! Follow them on Twitter, Facebook and Instagram. Sign up on Facebook or MeetUp. 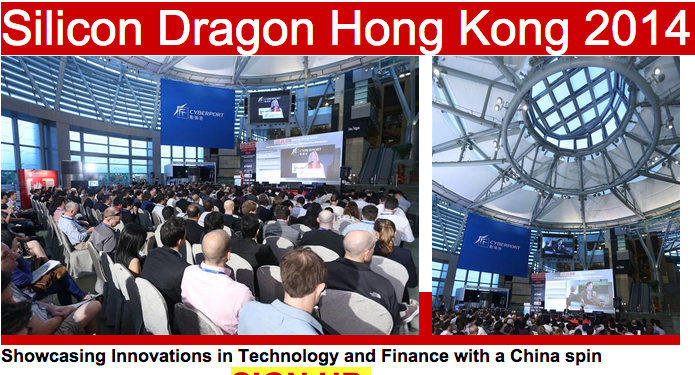 For a third year in a row, Rebecca Fannin (@rfannin), author, journalist and interviewer of technology start-ups all across world, brings her conference for venture capitalists and budding entrepreneurs, "Silicon Dragon", to Hong Kong on April 15th, 2014 in Cyberport. Web Wednesday members are begin offered 20% off the registration fee. When booking your tickets on Eventbrite here, don't forget to enter promo code, "SiliconDragonHKpartner", to enjoy the discount. It's worth it! This year, I will be interviewing Ilissa Howard, Co-founder of Milk and Honey Shoes, where women design their own stilettos and pumps with the click of a mouse. The are getting plenty of press and were recently covered in the New York Times. You can find them on Facebook, Instagram, Pinterest, Twitter and Google Plus. (No Chinese aspirations as yet! ).